Quick Thoughts: From the very first page, Caliban’s Wake had me enthralled. It’s a second novel that doesn’t suffer from the tradition second novel’s fate. It’s has a fully contained story, new characters that actually enhance the story and true emotional impact through a realistic portrayal of broken characters. Fans of Leviathan Wakes should not hesitate to jump into this latest tale of the Expanse, and for those new to the world, what are you waiting for? 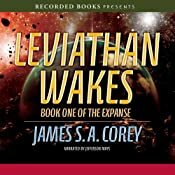 Leviathan Wakes was a novel last year that I listened to mostly because it was nominated for ALL THE AWARDS, most particularly in the science fiction category of the Audies. Well, that, and because the novel had Vomit Zombies. Honestly, if it wasn’t nominated for an Audie, and wasn’t on my list as a participant in the Armchair Audies event, I’m not sure I would have listened to the novel. While I love science fiction, the description of the novel didn’t really capture me. I’m actually less of a Hard Scifi guy that most fans, and tend to like more explody, almost pulpish scifi, over intricate space operas and wasn’t sure where Leviathan Wakes fell within the genre. Yet, I ended up listening to it, and liked it. Liked it, not loved it. It took me a while to engage with the story, to get a handle on the characters and become invested in the world. Simply put, I found the beginning kinda meh, and the ending pretty kickass. So, when Caliban’s Wake first came out, I was excited for it, yet, there was a delay between when the print version came out, and all my favorite Speculative fiction bloggers were raving about it, and when the audio version came out. In that two month delay, my enthusiasm began to wane. I think I started to realize that rarely does a second novel improve over the first. In fact, far too often a first novel holds a pretty self contained story, and then the second novel serves almost as a set up novel for the trilogies conclusion, leaving us with some sort of cliffhanger, and not offering a satisfying conclusion. So, although I snatched up the audio pretty quickly, it took a while to go from recent purchase to an active place on my listening schedule. Caliban’s War finds the crew of the Rocinante working for The Outer Planet’s Alliance hunting Space Pirates. Yet, when a strange incident on Ganymede leads Jim Holden to believe his boss has broken his trust and released a violent pathogen, the crew must find a way to uncover what happens, and search for a missing girl who may hold the keys to the conflict. Caliban’s War is the rare second book in a trilogy that actually improves over its predecessor in every way. While Leviathan Wakes spent a great deal of time intricately developing the complicated politics of Corey’s near future world, Caliban’s War jumps right into the action and never slows down. Yet, Caliban’s Wake isn’t just about Space Monsters, large scale battles and thrilling rescues, Corey gives us a glimpse of the changed Earth and its culture without dragging down the pace. Corey introduces a new character to the mix, Mar’s Marine Bobbi Draper that helps provide deeper incite into both Mars and Earth. Some of my favorite scenes were when Bobbi encounters the culture of Earth, trying to figure out how much of what she has been told about Earth is true and how much is just Martian propaganda. Filtering these scenes through Bobbie’s perspective gave us an outsider’s perspective, seamlessly integrating this bit of world building into the plot. Along the way Bobbi meets up with a powerful Earth politician, another new POV character Chrisjen Avasarala, whose political machinations only enhanced the story. So often when new characters are added to a series, I find myself longing to get back to those who I have already developed a relationship with, and this was often the case with the third new character, Prax, but with Bobbi and Avasarala, I was totally enthralled. Corey also does a good job showing how the horrific events that Holden experienced in Leviathan Wake changed him, and how it affected his crew and his relationship with Naomi. In fact, there is a lot of emotional resonances to be found within the pages of breakneck action. These are not cardboard characters that can shake of death and devastation with a wink and a nod, and each member of the crew, as well as the new characters, bring their own issues to the story, giving it more depth that your typical space opera or military science fiction tale. From the very first page, Caliban’s Wake had me enthralled. It’s a second novel that doesn’t suffer from the tradition second novel’s fate. It’s has a fully contained story, new characters that actually enhance the story and true emotional impact through a realistic portrayal of broken characters. Fans of Leviathan Wakes should not hesitate to jump into this latest tale of the Expanse, and for those new to the world, what are you waiting for? 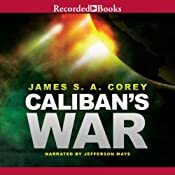 I’m not sure if it was just the fact that Caliban’s War was simply a more engaging tale, or some improvement by the narrator, but any reservations I had about Jefferson Mays performance in Leviathan Wakes was eliminated in Caliban’s War. Mays shows a total command over these characters. Mays particularly shines in his performance of new POV character Chrisjen Avasarala. Mays adds the right flavor to her voice, showing her strong character and acerbic wit. It is truly a highlight of the production. 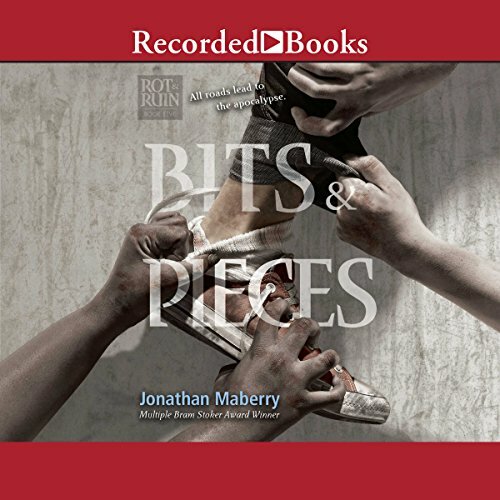 Mays pacing was pristine, he managed to make an almost 20 Hour audiobook feel too short. Yet, it wasn’t a perfect performance. There were a few scenes where his delivery didn’t match certain descriptive tags written into the story. For example, there were a few scenes a character is described as having “yelled” something, and it surprised me because Mays didn’t add anything, either in volume or urgency to those scenes. Mays uses a quiet confidence in his reading that usually worked, but at some moments his measured delivery muted key scenes. Yet, this minor complaint didn’t affect the overall feel of the book. Caliban’s War took a series I was interested in, and excited me enough to make the concluding novel Abaddon’s Gate one of my most anticipated science fiction novels of 2013.